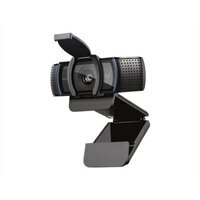 Logitech HD Pro Webcam C920S - Web camera - Color - 1920 x 1080 - AudioPolished, Full HD video calls. The C920 Pro HD Webcam delivers remarkably crisp, clear and detailed images in vibrant colors. HD autofocus and light correction adjust to the conditions to provide consistently high definition, while the five-element glass lens delivers razor-sharp images. Dual mics placed on either side of the lens capture the natural sound of your voice. The 78-degree field of view is wide enough to include a second person. Whether for a key Skype call, to demo your skills or create your next YouTube video, the C920 ensures you make a strong impression. Polished, Full HD video calls. The C920 Pro HD Webcam delivers remarkably crisp, clear and detailed images in vibrant colors. HD autofocus and light correction adjust to the conditions to provide consistently high definition, while the five-element glass lens delivers razor-sharp images. Dual mics placed on either side of the lens capture the natural sound of your voice. The 78-degree field of view is wide enough to include a second person. Whether for a key Skype call, to demo your skills or create your next YouTube video, the C920 ensures you make a strong impression.